The Old Foodie: In the name of Coleslaw. The Thursday “Household Hints” column of “The Perry Chief” (an Iowan newspaper) on this day in 1876 included a recipe for “Coldslaw”, or as we are more commonly (and correctly) likely to call it now “Coleslaw”. 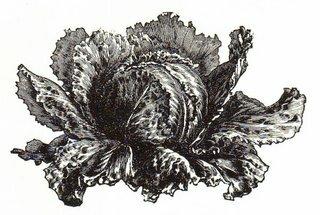 The word comes from two Dutch words – kool meaning cabbage and the word for salad, pronounced sla, but it is easy to see how the word was heard as indicating “cold” (sometime in the mid-eighteenth century) as that was the how the dish was served. It is a mysterious victory for the word police that the original version was restored, but it is not a complete victory. “Slaw” was not only sometimes spelled “slaugh”, it was occasionally used as if it was the cabbage word, so we can find “hot slaw” recipes (although I have not seen “hot slaugh”, thank goodness). This whole wordy saga took place in America, for reasons which remain (to me) obscure. Cabbage is the quintessential English vegetable, as the number of jokes of the boarding-house/overcooked-cabbage variety will attest – but recipes for it served raw in salad simply don’t exist until well into the twentieth century, and probably not to any significant extent until after the second world war. Coleslaw lost its virginity somewhere along the way. Cooks who want it “fancy” can make it with red cabbage (and maintain the colour theme by adding beetroot), and almost all cooks add other vegetables such as celery and carrot. A strange variation that merits specific mention is the jellied version. The short dark period of culinary history when the pinnacle of housekeeping was to place on the luncheon table a moulded jellied vegetable salad will, I am sure be a source of much discussion by future culinary historians. It seems to have been an American phenomenon, and the rest of us find it very puzzling. Perhaps an American reader could enlighten us as to what, exactly, is the appeal of jellied salad, especially as it is usually made, with sweet, coloured, fruit-flavoured Jell-O? Here is the recipe from The Perry Chief of October 26th 1876 that started this discussion. Coldslaw. – Cut up the cabbage very fine with a sharp knife, and sprinkle over it a teaspoonful of salt. For a large dish, say a quart of cut cabbage, use two eggs, a piece of butter the size of an egg, half a teacup of water and half a teacup of good vinegar. Beat the eggs, whites, and yolks together, very light, add the water ,vinegar, and butter, and put all in a tin on the fire, stirring all the time until it is of a creamy thickess. Pour it hot over the cabbage, stir up well with a fork, and leave to cool. 8 stuffed olives, cut fine. Dissolve Jell-O in boiling water. Add vinegar, salt, and cayenne pepper. Chill. When slightly thickened, stir in cabbage, apples, and olives. Put into individual molds. Chill until firm. Serve on lettuce with mayonnaise. Serves 6. I can't say precisely why congealed salads (or jellied salads, if one lived north of the Mason-Dixon line) became popular. The late 20's through the 50's trend for pairing lime or lemon flavored Jello (at one point, the company made vegetable-flavored jello, too) with vegetables like shredded carrots or cabbage sounds odd, but it worked. Certainly, using Jello was easier than making aspic from scratch. To this day, one can find congealed salad (likely lime with pineapple and carrots) at family reunions in the southern states. As kids we always called it "gangrene." Hello Nene. I had no idea that there was vegetable flavoured Jello! It sounds better than lemon Jello for savoury aspics. BUT - "congealed"!? - a dreadful word for a food item, isn't it? Jellied salad I could cope with, but "congealed" would take some courage.